Is IMMUNOSCORE® Colon the right test right for you? If you have Stage II or Stage III colon cancer, this test can help you and your clinician understand the risk of your cancer recurring and therefore make informed decisions about your personal treatment options. It is particularly valuable in assessing whether chemotherapy is necessary or appropriate when you have Stage II colon cancer. Ask your clinician how you can get this test. There are 30,000 new cases of colon cancer per year in the UK. Evaluating the immune reaction at your tumour site gives a much clearer assessment about the risk of recurrence, enabling you and your clinician to decide if certain chemotherapies are needed or beneficial. In other words, you are more able to avoid unnecessary treatments (and any associated side effects and cost). After your surgery, a tissue sample from your tumour is preserved for further testing. 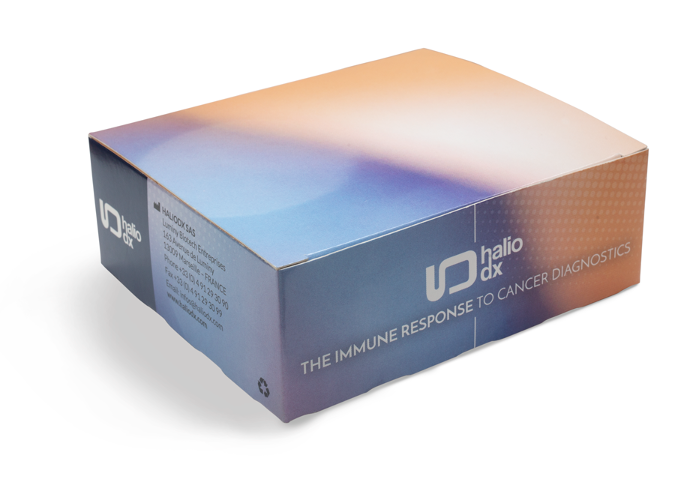 When your doctor orders Immunoscore® Colon, the hospital will send a portion of this sample to HalioDx laboratory to perform the test. You do NOT need to go through any additional procedure to get an Immunoscore® Colon. You will receive an email asking you to confirm that you have authorised Everything Genetic Ltd to be given a sample of your tumour tissue. We will contact your pathologist directly and organise the collection of your sample and delivery to the lab. Your sample will be analysed and a report will be generated, usually within ten working days of receipt of your sample in the laboratory. We combine tissue diagnostics and advanced image analysis technologies to quantify T-cells which infiltrate both the core of the colon tumour and its invasive margin. Your clinician will receive a comprehensive report covering both of these elements to enable you to plan your personalised treatment plan. There are some 30 000 new cases of Colon Cancer per year in the UK. Immunoscore® Colon is a unique diagnostic assay that can help avoid this by predicting the risk of recurrence of patients with early stage colon cancer. It combines tissue diagnostic and advanced image analysis technologies to quantify T-cells which infiltrate both the core of the colon tumor and its invasive margin. Studying these results provides unique guidance in choosing critical therapeutic options in stages II and stage III colon cancers . Performed on consecutive FFPE tissue slides, Immunoscore® Colon measures the density of two T Lymphocyte populations in the centre and at the periphery of the tumour: CD3+ and CD8+ T cells. Available as CE-IVD in Europe, the test provides a better characterisation of the disease and improves the clinical decision-making process for colon cancer patients. The test was discovered by Dr. Jérôme Galon and developed in compliance with the IVD standards by HalioDx. The clinical value has been validated in several studies on early stage colon cancer patients. Recently the results of the SITC International study  conducted on more than 2600 patients have been published in The Lancet journal. The prognostic value has also been validated on 600 stage III colon cancer patients from the FOLFOX arm of the prospective NCCTG N0147 study. Many health insurance plans cover the cost of specialist testing – check with your provider to find out if it is in your policy. Usually your clinician receives your results within ten working days of receipt of your sample in the laboratory.